BMW X1 is a big and powerful looking car that has sturdy build and offers off-road capabilities too. BMW X1 new model released during Auto Expo 2016 is an amazing amalgamation of class and style. It falls in the well above 4-meter category and has amazing features that compare well with its rivals in this price range. This muscular looking SUV has 2670mm of wheelbase that allows it to seat around five passengers comfortably. The design of this SUV looks masculine and the comfort level of this car is on par with other such vehicles in this price category. BMW X1 has an athletic look and is designed to be a head turner when it is driven on the road. 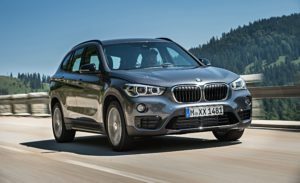 BMW X1 features includes a length of 4439mm and with an overall width of 2058mm. It has body colored bumpers. The well-known kidney shaped radiator grille has a bold design and has horizontal chrome stripe to give it a premium look. The headlights cluster is big and powerful and are equipped with LED headlamps. From the car’s side profile, you will notice body coloured ORVM caps (with integrated turn lamps) and door handles along with uniquely designed fenders, which house alloy rims mounted by tubeless radial tyres. The rear profile of this car reinforces the intimidating look of its front. BMW X1 Colors available in the market include, Valencia Orange, Glacier Silver, Black Sapphire, Mineral White, Midnight Blue, Deep Sea Blue, and Marrakesh Brown. The 1995cc unit puts out 190bhp and a generous 400 Nm of torque. The gearbox is also new – the 8 speed Steptronic with paddle shifters – which is very quick and well-mated to the engine. The revelation in fact is how quickly the gear changes go through, and also how quickly the engine responds – without the slightest hint of lag. Where the new X1 scores high also is in the ride department. The ride quality is completely un-BMW-like – meaning it is not stiffly sprung and the car glides over bad roads and offers excellent occupant comfort. The downside of all this though – Handling suffers – and so unlike the 1st gen X1 which was very confident going into sharp corners and hard turns, the new car is less enthusiastic by comparison. That brings me to the real big change on this car. The first X1 was based on the previous 3 series station wagon chassis and shared that car’s rear-wheel-drive platform. The new one sits on the new front-wheel-drive architecture platform from the BMW Group – a major change from the Bavarian company. The platform is also used by the new MINI hatch and the 2 Series Active/Grand Tourer. The MINI models are taut and compact, but like the 2 Series Tourers, the new X1 has to do therefore deal with both the front-wheel-drive and the higher centre of gravity due to the increased height. But the stability control system (DSC) does a fine job of keeping things together nonetheless, though you will probably find the Audi Q3 will handle better under pressure. Bmw X1 On-Road Price in Hyderabad ranges from 38,49,507 to 50,73,409 for variants X1 sDrive20d Expedition and X1 xDrive20d M Sport respectively. Bmw X1 is available in 2 variants and 7 colours. Below are details of Bmw X1 variants price in Hyderabad. Check for X1 price in Hyderabad at Carzprice. Prices are reasonably competitive and the Mercedes-Benz GLA in particular will really feel the heat. The X1 comes with 17″ alloys on the Expedition trim, while the rest have 18″ wheels. The car does have runflat tyres though BMW has provided a space-saver spare neatly concealed under a panel on the boot floor – with the jack nicely packed besides it. Very neat and still leaving ample room for tonnes of cargo. At 505 litres the boot is 85 litres bigger than the old X1 (and also just as much bigger than the Audi Q3’s boot). The rear seats can be folded down to get even more luggage space – at the touch of a button in the boot – very nicely done too. The X1 has 6 airbags, ABS, DSC, Dynamic Traction Control, and Hill Descent Control.